Actvity Summary: This activity follows the 5E format, allowing students to learn about the topic(s) using a variety of methods, ranging from teacher-directed learning, to student creation, to assessment. 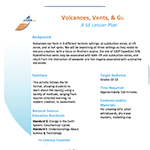 Volcanoes can form in 3 different tectonic settings: at subduction zones, at rift zones, and at hot spots. We will be examining all three settings as they relate to volcano creation, with a focus on Brothers volcano, the site of IODP Expedition 376. Hydrothermal vents may be associated with both rift and subduction zones, and result from the interaction of seawater and hot magma associated with submarine volcanoes.